Thrifty Thursday! Half price Baukjen Belt and Laura Ashley ex Display Bargain! As my regular readers will know, I'm a bit of an Isabella Oliver addict. However, it has been a bit confusing trying to differentiate the Isabella Oliver maternity collection from the Isabella Oliver "Womanswear" collection, after all, pregnant women are women too! Anyway, to make things easier, IO have changed their non maternity range name to Baukjen from now on. I love the new collection, easy to wear stuff, and for my birthday (coming up soon, 34 ah!) 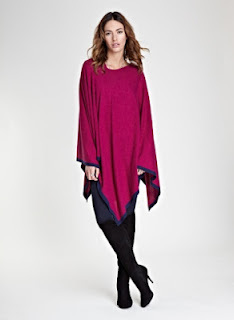 I'm going to go for something I thought I would never wear - a poncho! I see myself wearing this over skinny jeans with knee high boots with a fabulous belt, which is why I'm writing this post. 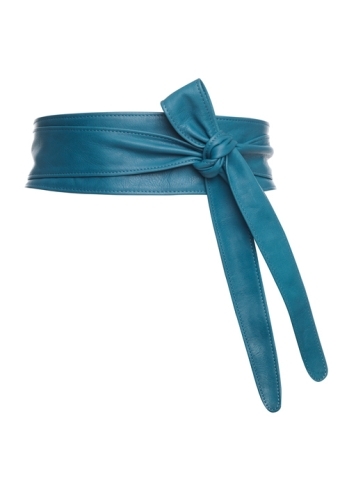 I really like this leather wrap belt, also from Baukjen, but wasn't really keen on spending £69 on a belt. Anyway, I got in touch with the lovely ladies at Baukjen and they luckily had one from the sale put away which I then got for £34! Bargain! It's not the same colour, in fact it's navy, but that will go nicely with the navy trim on the poncho. The point I'm trying to make is that if you see something in a sale and the sale then finishes, it's worth emailing the company involved to see if they can help, after all, it's in their interest to get rid of the sale stock, and you might even be able to negotiate a better price. On another note completely, we are decorating our house at the moment, and I've been on the lookout for a blind for our playroom, it's right at the front of our house and it would be nice to have a bit more privacy so we've decided to add a blind to go under our curtains. I happened to pop into Laura Ashley on Sunday on the very last day of their sale. On the wall were four display blinds, each with about 70% off, it just so happened that they were the right width for the window in question, so I managed to negotiate a deal, and got a £500 blind for £120! It's pure silk, duck egg blue and beautiful! There were loads of curtains as well for next to nothing (on display) but again, the lady in the shop said they just package them up when the sale's over so if you are after a bargain, it's worth asking if they have any ex display stock. If you need a matching pair you can also ring round the shops as quite often they have the same displays. Laura Ashley Silk Blind Bargain! I don't know about that! But I do love the belt!